Sorry for the wait but the new updates to fix that dreaded syncing issues many of you have reported are finally here. 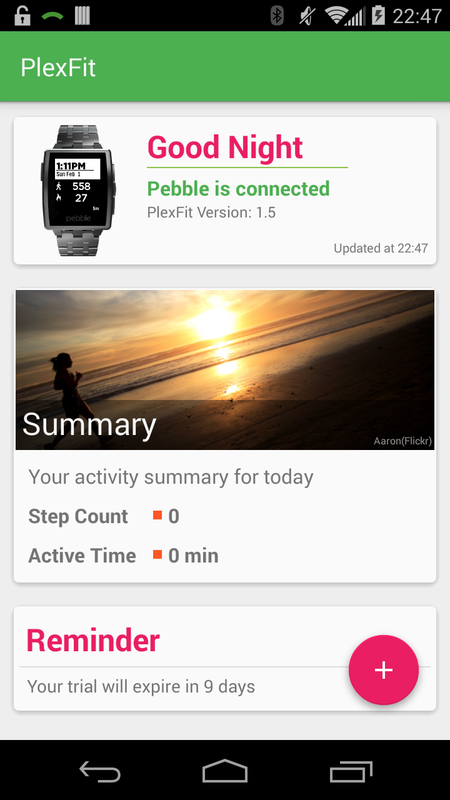 I have released version 1.1.0 of the Android PlexFit app and version 1.5 of the PlexFit Pebble App to the Google Play Store and Pebble App Store respectively. Added option to manually restore past license purchase for users who previously bought the app but have to uninstall to get rids of issues. Finally, I would like to use this chance to thank everyone who have sent me feedback and report bugs. Those were very helpful and critical in helping me iron out all the bugs. Without you, I probably would have never found them. Thank you for all your encouragement, your support and your empathy while I was struggling to debug this app. I hope that this release will finally give you the chance to enjoy the app and let me focus on adding more features next: sleep tracking, biking and running support. Some Pebble has their accelerometer calibration out of whack and right now Pebble doesn't have any calibration software to fix this issue. Calibration and user-customized sensitivity will come in the next update to address this issue. Sorry for the inconvenience. Misfit doesn't suffer this issue so while I understand it's not easy, you will end up with unhappy customers (indeed I paid right away to support you).